Here we are, my final Love 'Em Leave 'Em for the 2017 season. It's been another great season of fantasy football. I hope you're using this article, not just reading it because that means you're in the fantasy championship! We had a good week last week with 4/4 starts scoring over their projected totals. Let's hope we can continue the hot streak! Love 'Em: Drew Brees vs. ATL - Drew Brees hasn't quite had the year people expected, currently sitting at QB10 with 2 games left. However, New Orleans has a must-win game against the Atlanta Falcons and I expect Brees to show up in a big way. He had one of his better games of the season when they last played Atlanta, passing for 271 yards and 2 TD's - inches away from 3. The Saints were a Kamara-less team that game, a player who adds a different dynamic to the offense. I'm predicting Drew gets his 4th 300+ yard passing game of the season and his first 3 TD game since Week 3. Leave 'Em: Jimmy Garoppolo vs. JAX - This may seem obvious but I'm seeing a ton of lineups with Garoppolo at QB this week. He hasn't lost since he began starting in SF, but it's easy to know that streak will come to an end against Jacksonville this week. The Jaguars allow the lowest points per game to quarterbacks, allowing 3 passing touchdowns to only Russell Wilson this season. Jacksonville is one of the best defenses of the century, and Jimmy G is not good enough to overcome those odds. Love 'Em: Dion Lewis vs. BUF - The carousel that is the New England backfield limits him, but it doesn't take much viewing to realize that Dion Lewis is a really good RB. Lewis has one of the highest grades of any running back on Pro Football Focus. He's averaging over 5 YPC. Lewis has at least 65 total yards every week since Week 11 and should see even more action with Rex Burkhead on the sidelines. Buffalo allows the most FPPG to opposing running backs. Lewis is an RB1 this week. Leave 'Em: Marshawn Lynch @ PHI - Lynch faces one of the best defenses in the league this week in the Philadelphia Eagles. They're allowing a league-low 3.11 yards per carry on the year and the Raiders are not the type of offense to break a trend like that. They're a stagnant, conservative group this year and they look lazy at times. There's also a high chance the Raiders get blown out in this one, limiting Lynch's usage. Lynch did not do well this year and won't divert from that trend in Week 16. 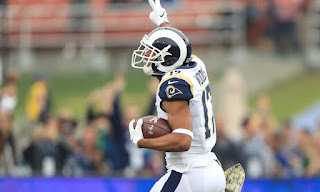 Love 'Em: Robert Woods @ TEN - Robert Woods came back from injury and picked up right where he left off, scoring 16.5 fantasy points in the Rams' blowout win over Seattle. That gives Woods 92.70 fantasy points in his last 4 games, which is WR1 production. Tennesee is no tough task, especially Adoree' Jackson who will be guarding Woods. Woods is a high-end WR2 in any format. Leave 'Em: Tyreek Hill vs. MIA - Because of Hill's big-play ability, telling the general public to start or sit him sickens me. But Miami, particularly Xavien Howard, have been playing shutdown defense the past couple weeks. We head back over to @beerswater on Twitter for a key stat about just how good the Dolphins have been in coverage. Over the past 5 weeks, the Miami secondary is allowing -10.0 points to opposing WR's when compared to the league average. No other defense is close to that figure. I know it's tough, but seriously consider benching Hill this week. Love 'Em: Greg Olsen vs. TB - Greg Olsen bounced back in a HUGE way Sunday, catching 9 passes for 121 yards and 1 touchdown. I would know because he was my sit of the week. I'm not making that mistake again, guys. Olsen has surpassed Devin Funchess as Cam's #1 target from here on out. Olsen's a top-5 option this week. Leave 'Em: Antonio Gates @ NYJ - Hunter Henry had been tearing it up before his injury, and there are people out there who think Antonio Gates will do the same. Nope. Not at all. Not even close. Gates has topped 30 yards receiving just once this entire season, and according to @beerswater charts, the Jets have been the best defense in the league across the past 5 weeks at covering tight ends. Well, that wraps up the in-season analysis for the 2017 season. But, content will still be produced immediately after the regular season ends. Thank you all for a great season, Merry Christmas, and good luck!